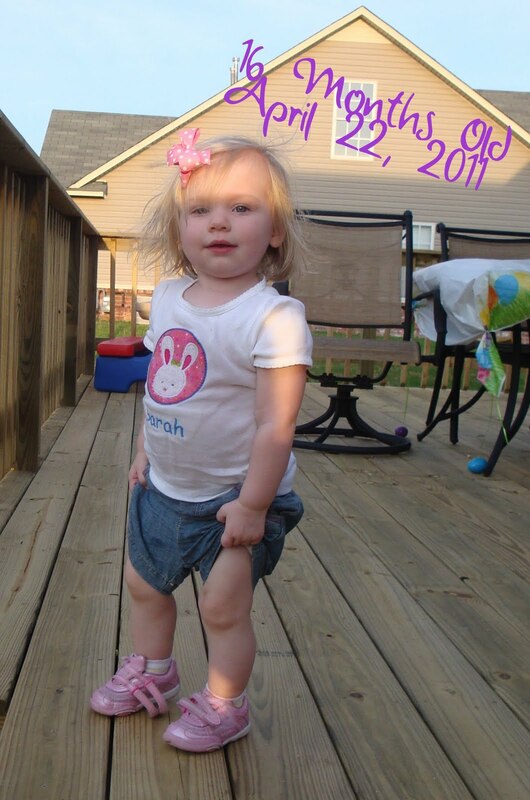 Sarah, you are 16 months old today. Here's what you've got going on. The main thing you're growing right now is your vocabulary. From the cute things like animal sounds to actual words that mean something life is getting a little easier now that you are starting to communicate better. Dr. Catherine said you needed at least 5-10 words to be on track and you have that (as long as we count animal sounds) so I thought I'd make a quick note of what words you do know for my own memory's sake. Sounds you can make when asked: cow, cat, elephant (with hand motion), duck, rooster, owl, bear (sometimes), pig (but it sounds a lot like the duck), and train (with cute hand motion). Words: up, more, outside, whee, shoe, bow, no (with finger waggle and head shake sometimes), car, Belle, uh oh, baby, please, cookie (which doesn't actually get you a cookie, it gets you a fruit bar). Phrases: "I see you", "hi dad", "help please", "more please", "up please", "where did it go" (which doesn't come out clear but thanks to your hand motions I know that's what you're saying). And you do try to repeat things when I ask you to say stuff. * You still sleep 7pm to 7am. * You take one nap a day in the afternoon. You typically go down around 1 pm and will sleep from 1.5 hours to 3 hours (getting more rare for the long naps). * You want a cup of milk as soon as you get up. It need to be in my hands when I walk in or you give me the stink eye. * You are very social and like to wave hello and goodbye to people and will blow kisses when asked. * You are pretty obedient. When I find you with something you shouldn't have I tell you to put it back and most of the time you do without any melt down. * You are obsessed with shoes, your shoes, my shoes, daddy's shoes. You don't care whose, but you want shoes. You talk about them a lot. You go to your closet door and point and say "shoes". However, you undo the velcro and still try to chew on them when we are driving. Sometimes that leads to me taking your shoes while I'm driving to prevent this bad behavior. * You love your hair bows. As soon as we put shoes on you say "bow" and walk over to the bow hanger. Sometimes you have a strong opinion about which bow you should wear and cry if I don't pick the one you want. Yet you still pull your bows out of your hair, so even though you like them it's not a perfect world yet. * You brush your teeth with tooth paste now. For the the most part you're just licking the toothpaste off the brush but I think it counts. * You like to try to wash your hands and your body and will start to rub the washcloth on yourself in the tub when daddy says "scrub, scrub, scrub". * You like to play the "where did it go game". You'll hide something in the hymnal at church and then put your hands up and say "where did it go" and then open it and say something like "there it is". * You recognized the I'm So Glad When Daddy Comes Home song and walk to the front door to look for him. * You know the sound of the garage door and go running when you hear it. * You've started signing "more", you also say the word too. I think this is an odd development. I tried to teach you sign language 1 day about 8 months ago and you wanted nothing to do with it. It was so frustrating that I never did it again. About 2 weeks ago you started signing that while saying it. It's cute. * You still love books and puzzles. My favorite book to read to you is "Moo, Baa, La, La, La" because you fill in the animal sounds you know. * You love things that are your size so we bought you a picnic table and some deck chairs. You'll carry the deck chair around to various locations to sit and relax. You also seem to prefer the blue chair to the red one and got angry when a friend tried to sit in the blue chair. We need to work on sharing. * You get really upset when you are told no. You'll cry and drop to the ground. * You tell us no a lot. It's still cute because it's not defiant (yet). For example, we'll say "do you want to watch Little Einsteins?" and you'll say no and shake your head, while walking to the couch to get ready to watch your show. * You don't know opposites yet. You say "up" whether you want up or down. * You don't say bye bye, you only wave. * You have 4 teeth coming it. It hurts. I'm sorry. It seems like every day you have learned something new which I'm not sure who's more excited about that, you or me. We love you sweet girl.